Chiropractic is the key to peak performance! 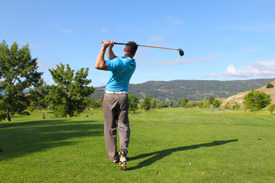 Whether you look forward to a great round of golf, spending time on the soccer, baseball or football field, or getting out on the tennis court, your enjoyment is always enhanced by playing your game of choice well. A body that’s in optimal alignment and perfect physical balance gets to have that experience with reliable predictability! It’s very common for me to successfully treat a variety of athletes and weekend warriors for injuries that result in tennis elbow, a sprained ankle, neck strain, shoulder dislocation and knee, hip and low back trauma. Such injuries can take them out of the game for a while and downgrade their athletic performance. I had a male patient who was very passionate about golf. He’d been playing for about 40 years, but noticed that he was struggling due to some chronic physical problems related to the sport itself. I immediately suggested some specific exercises that would help, but the patient seemed very skeptical. Apparently he decided to take my advice anyway, and the very next day this golfer burst into the office, and loudly announced to anyone in earshot that I was a genius! Within one day he had already improved his golf game by two strokes and increased his drive by a whopping 75 yards. Chiropractic and peak performance in sports and life are a perfect match. Achieve the results you’re looking for by contacting us to schedule regular chiropractic treatment.